(11-28-2017, 10:16 AM)LuvWetShavin Wrote: So, to those of you who have the Olfactory Hue .. do you like the scent? What do you consider the scent strength on a 1-10 scale? I used to be a big fan of CRSW scents, but this one is very disappointing. Mostly Musk like smell with some woodiness. Give it a 3 in scent strength which is probably a good thing. Have not shaved with it so cant say what happens to the scent when lathered. It better shave like crazy though to compensate for the scent. Now I have used the base and will follow up after shaving. I may reach a similar conclusion. It certainly is my favorite CRSW scent. Love the Olfactory Hue scent. I would rate the scent strength about a 4 or a 5. I wish it was a bit stronger. Best performing soap I own, very slick. Glad you guys like the OH scent. We should have no problems then filling up the remaining pass-around slots. Just shaved with Olfactory Hue. Wonderful scent and performance is an instant legend. Every other soap base on the market pales in comparison. Period!! This soap is incredibly good and nothing I've used can top it's performance. Slickness is unsurpassed, residual slickness is plain nuts, post shave is as good as it gets and the scents are well done. Olfactory Hue is beautiful. Madman's Bouquet flexes some serious scent making talent and Fragile Confusion is a nice departure from strongly scented soaps. I'm still in wonder at just how different this soap is from all the others. Big congrats Larry! Love these soaps, love the scents! I tried Olfactory Hue for the first time yesterday, and these are some of my first impressions. My scent preferences have drastically changed a number of times over the years. I currently like earthy and woody scents, such as oud and vetiver. Examples of soaps I like a lot are Mike's vetiver, JabonMan agarwood, and TSN/LPL oud-santal. Among CRSW soaps, my current favorite is the sandalwood. Earlier this year I thought to myself that I'd like to see an oud based CRSW soap. When I read about Olfactory Hue, I was encouraged because the oud/sandalwood combination sounded great. At the same time, I was apprehensive about what other notes might be in the mix. I have found that some soap makers add so many other notes to oud that its earthy character is lost. When I read that Larry had included frankincense in Olfactory Hue, I began thinking that perhaps Larry should have stopped at oud and sandalwood. Sandalwood already has an oriental aspect to it, and I felt the frankincense would push the scent too much to the oriental side. After trying Olfactory Hue, I can report that it's a lovely, well balanced scent. If it was entirely up to me I would possibly omit the frankincense altogether, but that just reflects my strong preference for a dominant earthy scent. However, Larry has blended the scents so masterfully that the earthy character of the oud is softened, but not lost. This has now become my favorite CRSW scent, and will likely become one of my top overall favorites among all soaps. I rate the scent strength at 6, which I find optimal for a scent of this type. I characterize the consistency of Olfactory Hue as a firm cream. I know Larry calls it a cream soap, but he could have called it a cream. Larry has a recommended method for lathering this soap which I did not follow. I face lather and would normally dip the tips of a wet brush lightly into a soft cream. 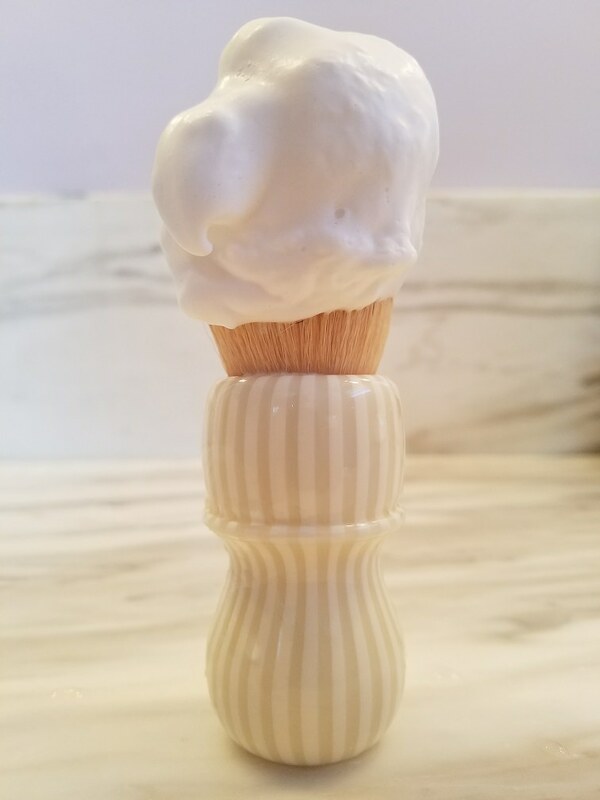 Due to the softness of this soap, I dipped the tips of a wet brush just slightly more firmly than I would do with a soft cream. 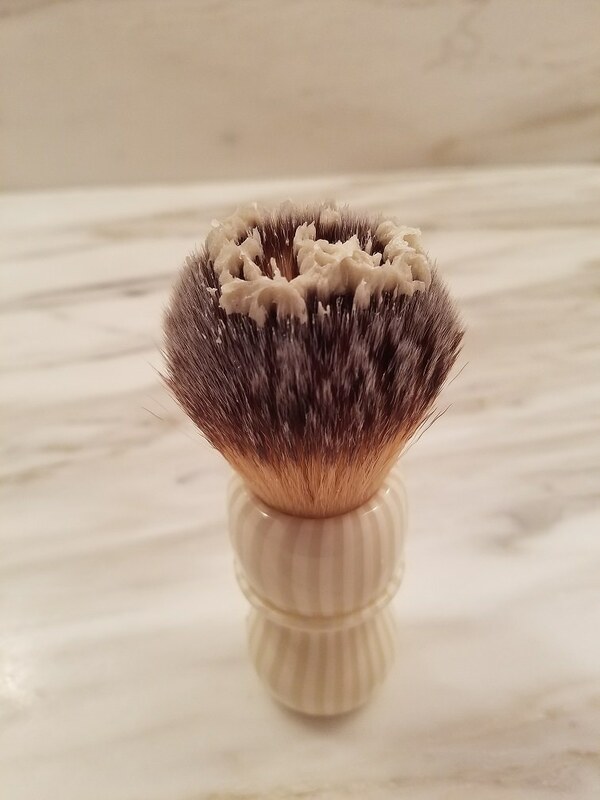 Here is what the brush and soap container looked like after I dipped the brush. 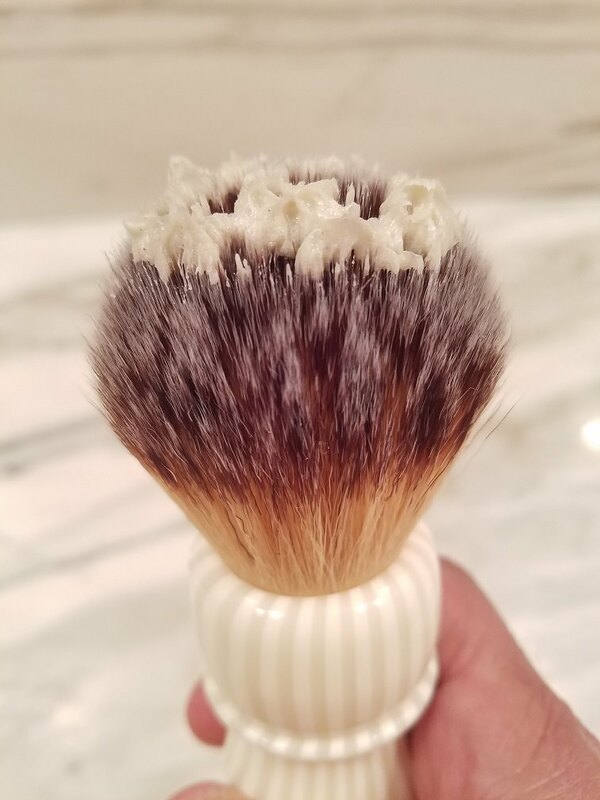 After dipping the brush, I did my normal face lathering and easily produced enough lather for three passes. There is no need to load this soap by swirling the brush in it for 30 - 60 seconds, as I would usually do with hard soap. In fact, doing that will result in overloading. I like the soft consistency of Olfactory Hue, and will not be leaving it uncovered for it to dry out. Rather than being repetitive, I will concur with the numerous positive comments above regarding the performance of the soap. After only one use, I can already conclude that the performance of this soap clearly puts it in the very top tier of all soaps. As I continue to use the soap I'll focus more on the slickness, which is where many users feel this soap is unequalled. Larry is to be commended for bringing such an exceptional soap to the market. Nice feedback, Ricardo. You may have just lightened my wallet a bit. 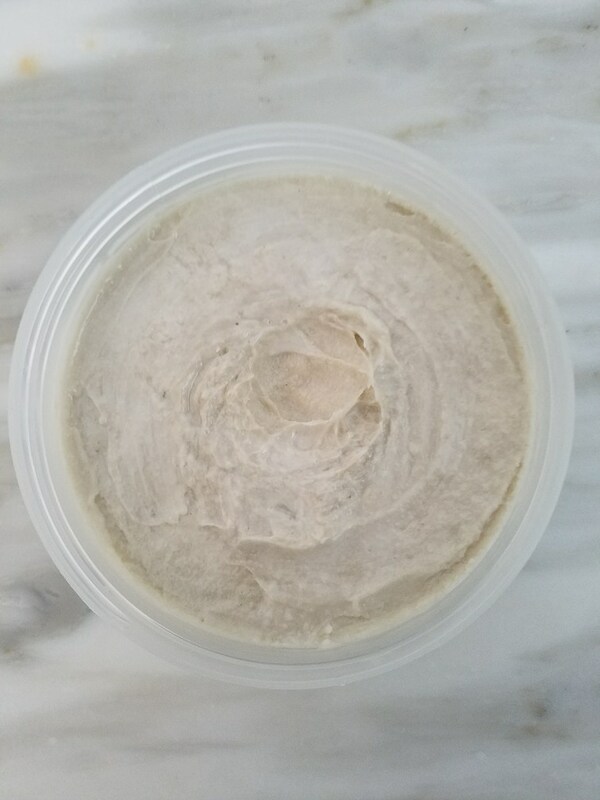 (11-28-2017, 09:06 AM)SweetReason Wrote: When I first receive a soft soap such as L&L grooming, I leave it sitting out for a few days with the lid off to let it harden up. That is interesting. Most artisan shaving soaps i've seen are hot process. All soap shrinks right after it is made from water evaporation and mine is no different. Maybe they are making the soap then immediately capping them? 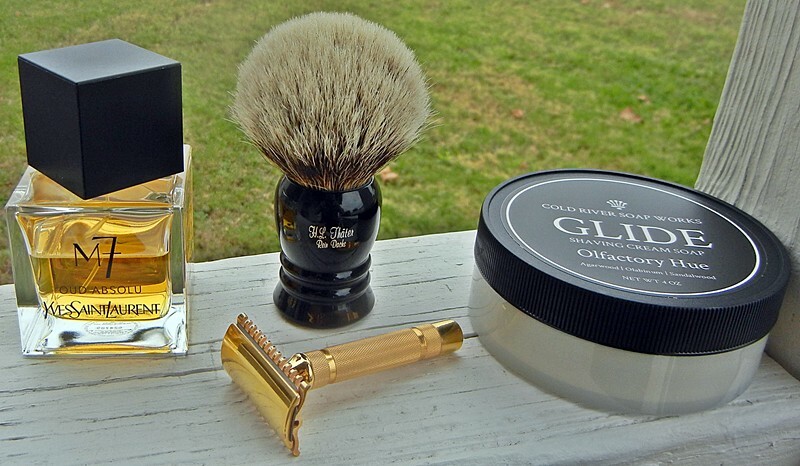 First shave with Olfactory Hue this morning. 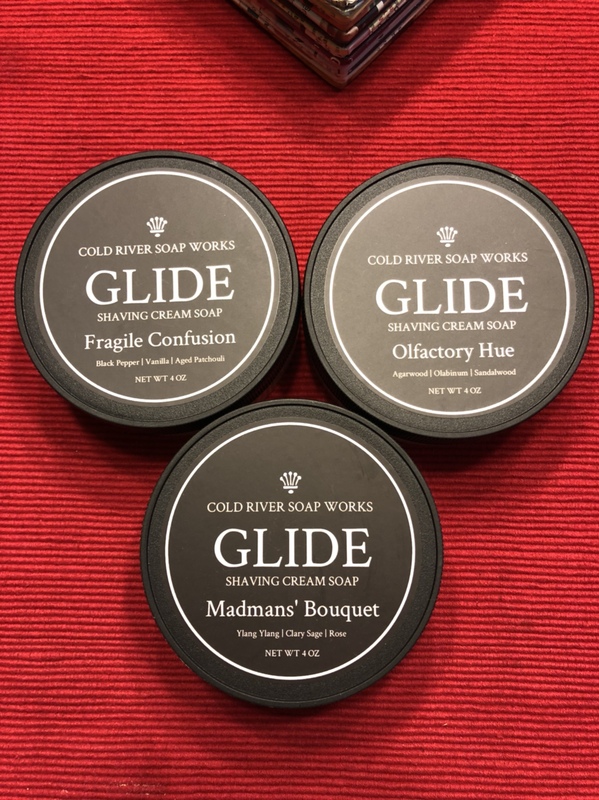 Immediate Top Tier soap and scent. Larry hit it out of the park on both counts!! Not what I was expecting being a floral but hot damn Madman's Bouquet is lovely. Performance of Glide is outstanding. Does anyone know how Madman's Bouquet compares to some of the other select scents? I have the Kauai and Tropicos, and it seems like Madman's Bouquet may be similar to them. (12-01-2017, 09:37 AM)TN4 Wrote: Does anyone know how Madman's Bouquet compares to some of the other select scents? I have the Kauai and Tropicos, and it seems like Madman's Bouquet may be similar to them. Happy to report: Madman doesn't smell tropical at all... it's not sweet/fruity and no amber... not aquatic. Etc. So would you consider it a floral-heavy scent? From the scent description it seems like it would be, but based on what others have said in this thread I'm starting to think that its not. (12-01-2017, 10:05 AM)TN4 Wrote: So would you consider it a floral-heavy scent? From the scent description it seems like it would be, but based on what others have said in this thread I'm starting to think that its not. Kind of a "dirty rose" from the ylang yland and clary sage... smells like tobacco in there too (not sweet like pipe tobacco... dry like loose cigarette tobacco). I have Tropicos and it's different for sure. Perfromance is also on a whole nother level when comparing Select and Glide. It's more than floral, it's spicy one minute, a tiny bit sweet the next, the rose peeks out then fades. It honestly smells like a super high dollar mens cologne. I was sniffing my hand after I rinsed out my brush and used the leftover lather to wash my hands. It is just a beautiful scent as I said in my earlier post. Complex for sure but so good. Thanks for your feedback, that definitely sounds like something I would be interested in. Seems like Larry is focusing more on cologne-type scents these days.